Getting children to learn and incorporating value education in the classroom is a challenge for all educational institutions and educators. Finding innovative ways of engaging children is critical to getting them to learn effectively. Our experience of working with children in rural schools has shown us that such methods are especially important in settings facing resource constraints and which have children at different learning levels. Since 2007 we have been trying out various tools to keep children engaged and to bring value education in the rural schools where we are working. Earlier this year we developed a tool called ‘Vilayadi Membadu’ or ‘Play and Improve’ – an experiential and fun learning aid for children in elementary school. 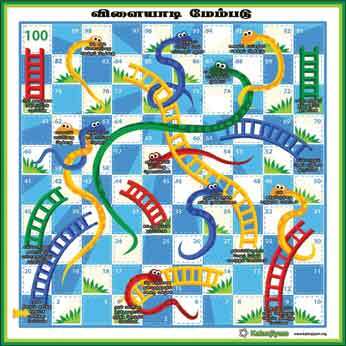 This tool is based on the traditional ‘Parama padam’ or snakes and ladder game. Among other things, it is meant to help teachers talk about positive and negative attitudes, practices and actions in a fun manner so that important messages with values get firmly imprinted in the children’s minds. The ‘Play and Improve’ tool can be used by teachers, para-teachers or other facilitators in the school. The tool is an 8ft by 8ft flexi board, which can be spread on the classroom floor with squares numbered from 1 to 100. The aim of the game is to walk these squares and the player who reaches the 100th square finishes first and wins the game. The author is the Founder-Director of Kalanjiyam. He can be reached at kalanjiyam@gmail.com.